When I became a Mum 5 years ago. I lost myself. I worked out eventually how to be a Mum, enough to do it a second time and once I went back to work I remembered how to be the working me. But honestly I have realised I didn’t actually know how to be the me-with-kids. It was easy to ignore working full time the last few years, I didn’t really have the time or energy to be anything else but working-me and mum-me but recently working from home and part time. I have started to think again. Mum-me does the PTA , sorts out playgroup ,makes sure my kids are growing and healthy and increasingly read and do their spellings. Work-me is mostly organised delivers and sometimes pulls an all-nighter due to a combination of insomnia and foolhardiness. But I totally forgot about the external things that I want. I know in the last 5 years it has been almost impossible to get the one essential my introverted-self needs , an hour or two a day alone reading a book (it has often happened at 3am). So anything more seems like indulgence. And oddly I realised this morning at Issy’s playgroup one thing I really miss. I had just spent 20 minutes extolling the virtues of a pressure cooker to someone when a lovely Mum, who runs Korean Cookery courses offered me some of her homemade Kimchi. It was a lightbulb I love to cook and this lovely blog let me share it with other people and gave me so much pleasure. And it was really me-me….. So to hell with it blogs are old school we are all v-log and it’s really all about clean eating. 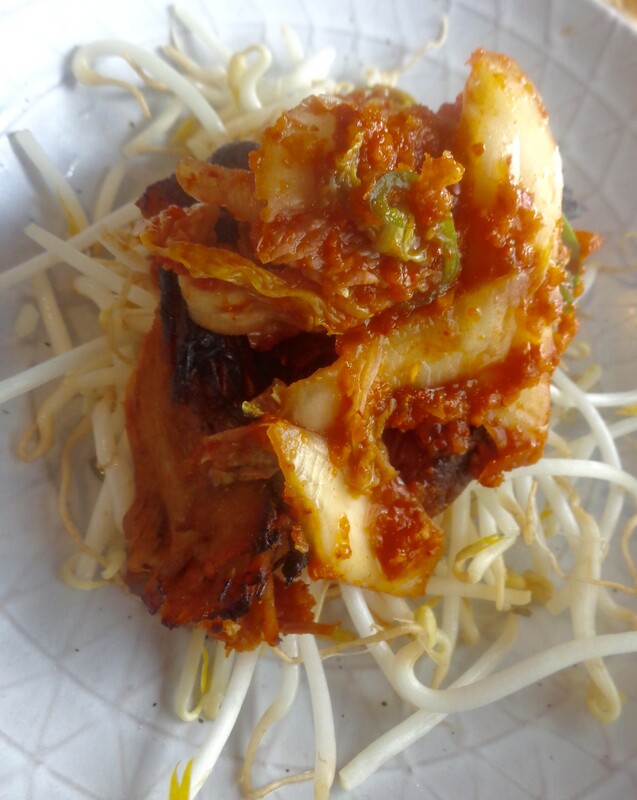 So here , kimchi from the lovely Inkyung ( I’ll get the recipe soon…. it was much less salty than mine) . I served it with some pressure cooker pulled pork …. out the freezer and some beansprouts. It was delicious and writing this was pretty lovely too. Really really pleased you are back. I totally understand your comments but I miss your originality. I went on a Teach Others to Cook course and met like minded people. We were like a load of geeks together it was brilliant and made me feel great. So carry on.